The sun is shining (in Cork anyway), the weather is thawing and Ballymaloe Foods are back in Festival Mode! Wave goodbye to the winter and welcome the New Year with a new festival. We are proud to announce that Ballymaloe Foods will be sponsoring Cork Burger Festival! Running from January 30th– February 5th 2017 Cork Burger festival will take place in multiple locations across the city and county. With so many restaurants involved we foresee a wide range of yummy scrummy burgers! Which burger do you think will will be crowned the winner? 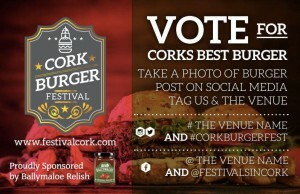 Let us know using #CorkBurgerFest – we want to see all of your instapics and hear all about your festival experience. Which is your favourite Ballymaloe sauce to enjoy with a burger? It’s a close call between Ballymaloe Original Relish, Jalapeno pepper Relish and our new Steak Sauce. Did you know that Ballymaloe Original Relish is delicious when mixed in with the meat in homemade burgers?! Let’s hope the participating restaurants know that little tip! Thanks to Festival Cork for organising the Cork Burger Festival. How do you make a hamburger laugh?